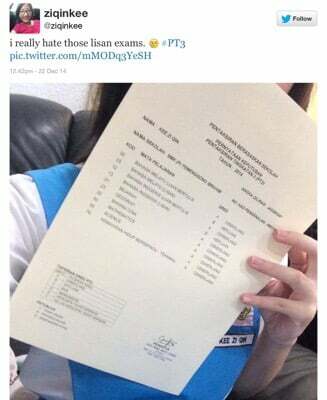 It is hard to say, why parents should be so upset with the recent PT3 results. As an educationist, I am not into the idea of mass instructions reflected by this centralized series of exam. There are so many reasons, be it economic, political, cultural, or even psychological, why the exams fail to serve justice. Students are individually unique and the standardized exams are always good at ignoring them. Teachers and schools know their students better and school should have the autonomy to design the assessment based on the uniqueness of each institution. At least, part of it is exercised through this new PT3 where marking is not centralized. And the poor result should be taken as a measurement for improvement at school level, rather than blaming here and there. There’s nothing to be upset. The result does not determine anything. Not even SPM, not to mention the future of our kid. It is quite interesting to see the ‘non-elite’ schools obtain better results than the famous ones. Claiming that PT3 gave too much portion on assignments and KBAT sets of question (kemahiran berfikir aras tinggi / high level of thinking skills), it might be useful if we can see how the students in the ‘average’ schools learn compared to those in the elite ones. I remember last year, I had a program in Lenggong with teenagers, many of them are students. After the program ended, three of them got into my car for me to drop them at Kuala Kangsar bus station. Me: Are you guys studying now or what? Student: We are doing our diploma in ICT at UiTM. One more semester before graduation. Me: I see. Good for you, man. So, what’s up after graduation? What’s the plan? Student: We want to continue our study at degree level. But it is expensive. We don’t want to take the PTPTN loan. It’s gonna cause us bigger problem in the future since we don’t think we will be rich enough to pay the loan easily. As for me, my dad is paying for my sister who is now studying in Egypt. My younger brother is at the boarding school. I don’t want to add more burden on him. Me: You’re right at the loan thing. Don’t start your life with loan. And you’re very thoughtful at considering you dad’s struggle. So, what is it in your head now? Frankly, I was so overwhelmed listening to them. These were average students, from kampung, not among the cream of the cream and resourcefully speaking they were limited. But they have this high level of thinking skills and they know what’s happening around them, and how to overcome all the obstacles expected. Their hypothetical thinking on real situations is working, they have the wisdom and risk taking skills. All these are the essential skills of life. What else do you want from your kids other than these skills? I don’t think they were the straight A’s students. Their lab is limited. Their computers at school could be the old ones. But the work on it. They find their way to survive. And the got what education should give. In fact, we are now dealing with weird young professionals, graduated from world class universities, who cannot think straight and outside instructions. We know that they were the straight A’s students, many from the elite schools. We at KMSS decided not to take PT3 for our students. But as for those who do, embrace the poor result with sincerity. Education is for them, not us. Education is about us, not them. Our children need less teaching, and more learning.